Wittenoom is a ghost town, located 1425 km North of Perth in Western Australia via Newman. It is 460 m above sea level. It has become famous for being a ghost town as it was removed from the Western Australia maps in 2007 and legislation was introduced to forcibly remove the last three residents in 2015. For the uninitiated, demolishing a house can be a daunting task. There are countless factors that can affect the time and cost of your demolition job, lots of paper work to sign and then there’s the actual structural demolition. So what is your house really made of? Sure, it seems like a simple case of taking a look at your home (I mean everyone knows what bricks or wood looks like, right? ) but as the old saying goes, looks can be deceiving. Houses are often designed to look like they are made from one thing, while actually being made from another. A great example of this is homes with a brick facade. 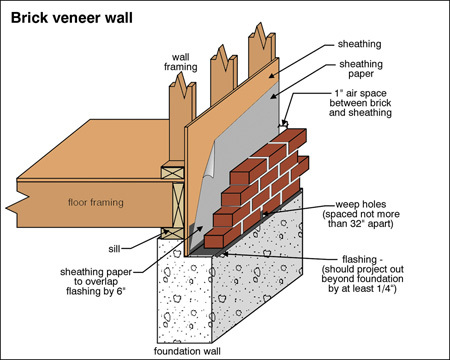 Brick facade, otherwise known as brick veneer, is often cheaper than solid brick or double brick walls and provides the same aesthetic benefits and often better insulation. It’s the style and durability of brick at a portion of the cost. Unlike a solid brick wall, which structurally is of importance and holds up the house, brick facade is held up by the house. In brick facade the bricks are essentially siding and are placed on flashing in front of a wood or fibro frame. As the name suggests, brick facade is all about giving the illusion that the entire dwelling is made from brick, and when done well it appears indistinguishable from a solid brick wall. Although this is certainly great for aesthetics, brick facade can make for complications when it comes demolition time as one of our recent demo projects proves! This particular brick facade job was so well done that the house was thought to be a solid brick house with interior floating panels. It wasn’t until our asbestos removal crew started to remove the asbestos panels from inside the laundry at the back of the dwelling that they realised the entire home wasn’t brick at all - it was an asbestos clad fibro home with a brick facade. Our crew in action, removing the brick facade to expose the asbestos fibre boards. As we’ve talked about in previous blog posts, the asbestos removal process is tedious and labour intensive. In order to remove asbestos safely and in line with Australian asbestos removal regulations, each piece of asbestos panelling must be individually removed with minimal damage, wrapped in plastic and placed in a skip. In this case, the only way to get to the exterior asbestos paneling was to remove each brick by hand. This unfortunately meant that the demolition job became more involved and labour intensive than initially anticipated. Regardless, our skilled asbestos removal crew was up to the task! How Can I Speed Up My Demolition.